It is virtually certain that 2015 will be the warmest year on record, with one of the strongest El Niños ever recorded combining with manmade warming to send global temperatures soaring. But which of these is more responsible for the record heat this year? Global warming fueled by the buildup of heat-trapping gases in the atmosphere is the overwhelming contributor, according to a new analysis by scientists involved with Climate Central’s World Weather Attribution program and at the University of Reading. The gray line on this graph shows observed surface temperatures from 1880 to 2015. The red line shows the effective temperature forcing of greenhouse gases and aerosols (converted to CO2), and the blue line shows the forcing from both those manmade sources and natural factors, like solar radiation. Early on in the temperature record, the red and blue lines diverge because natural factors meant the full impact of greenhouse gases on temperatures wasn't being felt, but in recent years, the two lines match closely, showing how much greenhouse gases are dominating global temperatures. 2015 is slightly above the red line because of a small push from El Niño as well as even smaller contributions from solar radiation and random weather variations. That analysis, which broke down the effects of a number of different possible influences on the global temperature, found that El Niño provided only a relatively small, though still noticeable, assist. And with 2015 not even officially yet in the record books, 2016 could see even more of a warming boost from El Niño, thanks to the delayed effect it has on temperatures. 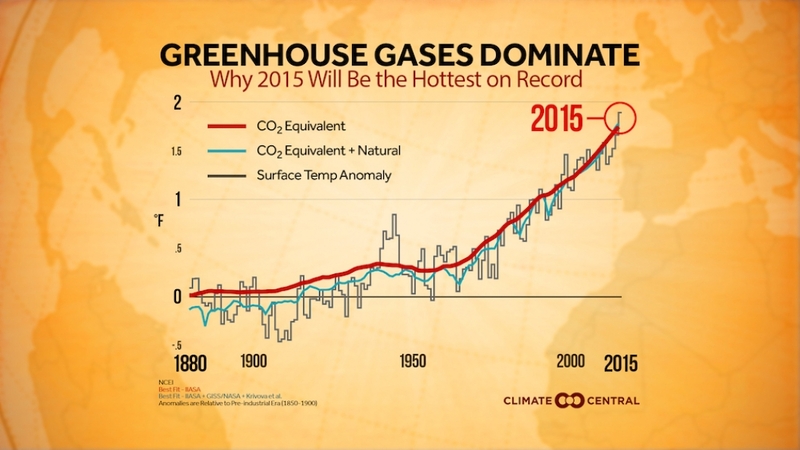 “2015 is a climate milestone in several ways. Atmospheric carbon dioxide has now passed 400 [parts per million] for the foreseeable future. It will also be the warmest year on record, primarily because of anthropogenic emissions of greenhouse gases, with CO2 being the main culprit,” Ed Hawkins, a climate scientist at the University of Reading, said in an email. The average global temperature for 2015 is well ahead of last year, the current titleholder of warmest year. October provided a particularly large boost, with a temperature that was above average by more than any other single month in the past 135 years. By NASA’s reckoning, October was more than a full degree Celsius (nearly 2°F) above the average from 1951-1980, the first month that has ever happened. The new analysis underscores what climate scientists have long been saying: The unabated accumulation of carbon dioxide and other greenhouse gases in the atmosphere is steadily raising the planet’s temperature. The CO2 levels that are currently rising above 400 parts per million are unlikely to drop below that mark for the foreseeable future — a stark difference from the 280 ppm that prevailed before the Industrial Revolution. To figure out the relative contributions from all these potential factors, the WWA program team did a simple analysis that matched up surface temperature measurements going back to 1880 with two other sets of data. One just included the effective influence on temperatures from manmade forces (including greenhouse gases and aerosols, which tend to have a cooling effect), while the second included both manmade and natural ones (including volcanic activity and solar radiation). To come up with a final temperature for this year, the analysis assumed that November and December would differ about as much from average as August and September did (given that October had a boost from particular weather patterns). With that assumption, the year would finish out 1.05°C (1.89°F) above the average from pre-industrial times, which the Intergovernmental Panel on Climate Change has defined as 1850-1900. Click image to enlarge. 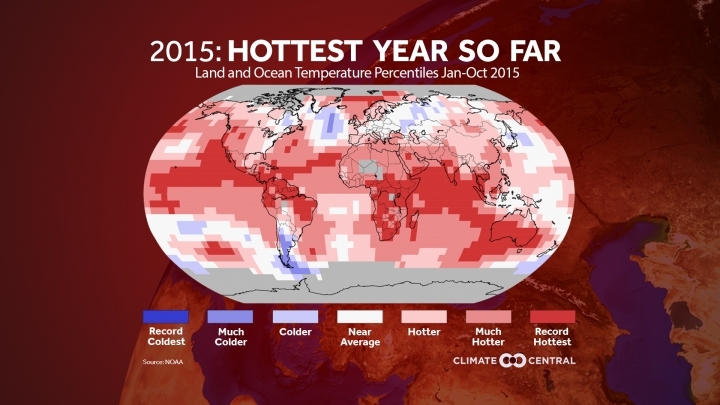 How temperatures across the globe ranked for January - October 2015. Negotiators are meeting in Paris next week to try to hammer out an international agreement to limit warming to no more than 2°C (3.6°F) from pre-industrial times, a mark the analysis makes clear the world is already halfway toward reaching. The contribution from El Niño depended on how long the delay in its effects on temperature was determined to be. The analysis calculated a delay of about five months, which resulted in El Niño contributing about 0.05°C (0.09°F) to 2015’s elevated temperature. Shorter delays, as others have calculated, raise that contribution up to about 0.1°C (0.18°F). The delayed effects of El Niño mean it is likely to have a larger impact on 2016’s temperature than it did this year. This also happened during the major El Niño of 1997-1998, which had its biggest temperature impacts on that second year. Of course, how 2016 will ultimately rank is impossible to say at the moment, given other factors that could come into play and can’t yet be predicted, but, as this analysis makes clear, the heat steadily building in the atmosphere is the major force pushing Earth’s temperature ever higher.